We all have to work with people we can't stand to be around. 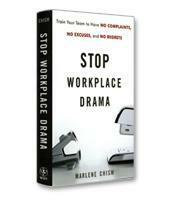 Our challenge is to find creative ways to handle these difficult people. 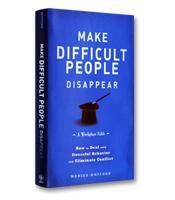 In the fable Make Difficult People Disappear, the skills and strategic plan needed to change your mindset are told through a clear, concise story. Make Difficult People Disappear by trainer and CEO coach Monica Wofford is essentially a fictionalized narrative version of a training session devoted to a personality assessment tool called the CORE Multidimensional Awareness Profile®. The acronym stands for Commander, Organizer, Relator and Entertainer, the four personality types that form the basis of the tool. As Wofford explains, no individual is a single type; instead they are usually dominant in one type, secondarily dominant in another, third most dominant in another and dormant in the fourth. People who appear difficult to someone, Wofford writes, are usually people who have different personality types from that person and are therefore unlikely to think and react in the same way. To make her point, Wofford describes, in detail, the four personality types before exploring, in greater detail, the implications for the main protagonist of her book. Commanders, the first type, are ambitious, focused and extremely task-driven. They view others as either contributors or inhibitors to their productivity. The author emphasizes that under stress, the Commander can come across as bossy, controlling or overly dominant. What’s important to remember, according to Wofford, is that the labels describe behavior — that is, what a person does, not who he or she is. As Wofford explains, "Labels allow us to simplify behavior and people assessments, but people aren’t simple and neither is their behavior; nonetheless, we oversimplify and use name tags and colors and labels to categorize people instead of learning skills that enable us to read what they are showing us at the moment." The second personality type covered in the book, Organizers, are left-brained people who tend to be linear and logical. They carefully think through their options before making a decision. Organizers are needed on any team because they are often the only ones to think through every detail. Relators, the third personality type, are loyal, trustworthy and caring. Traditionally, women have been considered the Relators in society, which can lead to some interesting repercussions. According to Wofford, many women actually suppress their dominant Commander preference, while men with a preference for the Relator role are equally constrained to hide their natural behavior preference due to societal perceptions of gender roles. The fourth personality type is the Entertainer, the people who are the most enthusiastic, charismatic and energetic. Entertainers also have short attention spans, which can drive the cautious, thoughtful Organizers mad. The lesson of the CORE methodology, according to Wofford, is that "difficult" people are often just people of different types who react in different ways to situations. Commanders will become aggressive when under stress or angry, and this can be very disconcerting to the other types, especially Relators. Relators tend to systematically avoid conflict and become quiet or passive-aggressive in the midst of an argument. This behavior can be infuriating to Commanders. When dealing with the different personality or behavior types, leaders must understand the needs of each type and adjust their approach accordingly, Wofford writes. Organizers, for example, need: details and facts; order and logic; and to be right. Relators, in contrast, need: reassurance, guidance, direction and stability. An Organizer who must talk to a Relator about the Relator’s unprofessional behavior, for example, is likely to list the infractions of the Relator and explain the consequences, including termination, if the behavior doesn’t stop. The Relator will respond better, however, if he or she is given guidance on what to do and offered stability. While personality types are nothing new, the fable approach is particularly effective for this topic; the protagonist not only interprets the trainer’s coaching through the lens of her personality type (Commander), but also constantly draws parallels to her personal life with her husband and son — relationships with which most readers will connect. The extensive online resources available with the book make it a useful tool for managers at all levels.